Joshua tree is one of the most characteristic plants of the Mohave Desert and extends southward to the Mohave-Sonoran Desert ecotone. This species grows from southern California, Mexico, and western Arizona eastward into southern Nevada and southwestern Utah. Var. brevifolia reaches its greatest abundance in the vicinity of Joshua Tree National Park; California. var. jaegeriana grows primarily in the eastern portion of the Mojave; var. herbertii is restricted to parts of the western Mojave Desert in California. The Joshua tree was named after the biblical leader, Joshua, as it reminded the Mormon pioneers of the hero raising out-stretched arms toward the heavens. William Lewis Manly referred to them as "cabbage trees" in his book (Death Valley in '49), about the rescue of the Bennett and Arcane families from Death Valley. Pedro Fages, in his expedition along the edge of the Mojave searching for deserters from the Spanish Army, called the ungainly trees "palm" trees. Joshua tree is a large, erect, evergreen, arborescent monocot. It is generally single-stemmed, but plants with two or three stems also occur. Joshua tree is the largest nonriparian plant of the Mohave Desert, reaching heights of 16 to 49 feet (5-15 m); the huge reddish-brown to gray trunks can grow to 2 or 4 feet (0.6-1.2m) in diameter. Erratic branching generally begins 3 to 10 feet (1-3 m) above the ground and is often caused by the yucca-boring weevil which destroys the growing tips. Branches are erect, ascending or spreading, and form a dense, compact, rounded top. The soft, corklike bark is rough and fissured. The inflorescence is a crowded, brittle often glabrous panicle. Globose flowers are greenish-white or gray and papery at maturity, with an odor described as "unpleasantly mushroom-like". The exact age of Joshua trees may be difficult to determine since annual rings are not produced. The overall shape, however, can provide a general range. 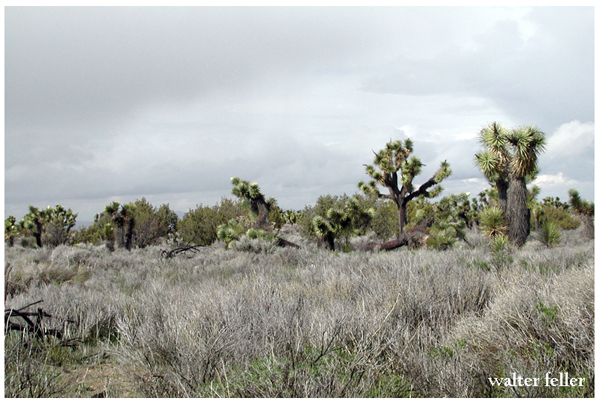 Juvenile Joshua trees are generally unbranched; middle-aged plants are forked and dense. Older trees generally have a single stem and an open crown. var. brevifolia - tall, stout stem, branches mostly 3 to 10 feet (1-3 m) above the ground. var. jaegeriana - smaller, 10 to 20 feet (3-6 m) tall, branches mostly 2.3 to 3.3 feet (7-10 dm) above ground, more compact. var. herbertii - many stems forming clumps up to 33 feet (10 m) in diameter, long rhizomes. Seed and seed dispersal: Seeds are contained in dry, spongy, indehiscent baccate fruits which average 3 inches (69 mm) in length. Fruit first develops near the base of the inflorescence while the upper part is still in flower, and averages 25 to 40 per cluster. Annual fruit production varies greatly under natural conditions. Generally, fruit is produced only in wetter years. On extremely harsh sites the Joshua tree flowers rarely, if at all. Seeds are dispersed chiefly by wind and animals. Birds frequently open the fruit, exposing seeds for subsequent wind dispersal. A number of desert rodents are known to cache Joshua tree seeds and may also disperse seed. Fruit can persist on the tree, but usually disintegrates rapidly. Joshua tree grows on desert plains, alluvial fans, slopes, ridges, bajadas, mesas, or foothills. Trees are often smaller and less common away from the base of desert mountain ranges; the species is generally absent along the eastern edge of the Mohave Desert. The slow-growing, long-lived Joshua tree is an important constituent of a number of climax desert communities. It is generally not well represented in most seral communities. Joshua tree requires sufficient precipitation for flowering to occur. On some extremely harsh, arid sites, flowering rarely if ever occurs. Start of flowering is probably controlled primarily by daylength. Variation in flowering dates according to taxonomic variety and geographic location has been noted. Most annual vegetative growth of the Joshua tree occurs during a 5-month-long winter-spring growing season. Rhizomes of the Joshua tree are capable of cloning a new plant providing a way for the parent plant to propagate. Fruit can persist on the tree, but usually disintegrates rapidly. Flowering usually occurs in the spring between March and May.